The IPL is set for an early start this time with the World Cup approaching in May 2019. The Player Auction was held in Jaipur on 18th December, which was a subdued one when compared to the previous year's bigger one but there were few surprise buys and few uncapped and unknown players being paid a lot of money. Few of the top buys were Varun Chakravarthy ( 8.4 Cr), Jaydev Unadkat ( 8.4 Cr), Sam Curran ( 7.2 Cr) and Colin Ingram( 6.4 Cr). There were a few players relatively unknown to most and the teams had clearly opted for younger talent than older players and that showed in the omission of Brendon McCullum, lack of bidding for Yuvraj Singh which gave him away cheaply to Mumbai Indians. Here are unknown players in each team who can shine. Varun Chakravarthy is certainly a popular player now with the media bandwagon and social media flooding with reports on the auction. But not much is known about the mystery spinner who returned to playing cricket after 7 years and within 2 years, finds himself in the Kings XI Punjab's den. His action is similar to that of an off-spinner but he claims to have 7 different variations which he can release with the same bowling action. With limited domestic cricket telecasted, experts found it hard to analyse his bowling and this mystery factor might very well be his greatest strength. 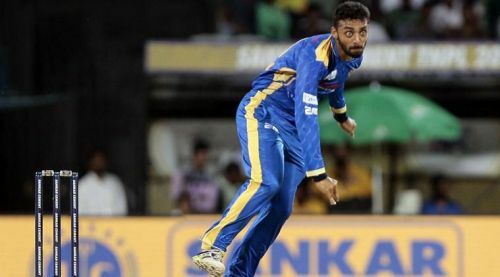 While in the past, many mystery spinners and uncapped players who have been paid a lot of money have failed, Varun could succeed in Kings XI colors especially after Mujeeb ur Rahman, another mystery spinner's success last season. Though it'll be interesting to see where he will fit in, Varun is the biggest unknown entity of the tournament. KXIP also have Hardus Viljoen, the Proteas pacer who topped the wickets' charts in the T10 League and was the 'Player of the Tournament' competing with T20 cricket's biggest names yet most people don't seem to know him. He can be a real asset in case the IPL is shifted to South Africa.